First up is a doorstop of a title, Prehistoric Life: The Definitive History of Life on Earth from DK. With a wide group of contributors and a staggering number of full color illustrations and photographs, this 500-page monster is what all other coffee table books wish they could be. With timelines, fossils, healthy discussion of what we know for sure and what we think, mini-biographies of significant figures in the world of natural history and paleontology, plus more discussion on more dinosaurs then any Jurassic Park fan can stand, this is the book to beat when it comes to the subject. What�s really nice is that the younger set (and we�re talking down to dino lovers of the six- and seven-year-old variety) will love the pictures, while older readers will find the information to be equally dazzling. It is not a book that can be outgrown, however, so while it has a hefty price, it should be viewed as an investment. This is the book that all others can spin off from -- if you find a creature or person or period that interests you after reading Prehistoric Life, you can look deeper in that direction elsewhere. In the meantime, though, your interest will have been piqued by the gorgeous presentation here (from the cover to the endpapers, beauty is the standard) and readers will likely move on to places they never knew existed as they read about creatures they can barely imagine. Extreme Scientists: Exploring Nature�s Mysteries from Perilous Places by Donna Jackson looks at three scientists engaged in unusual research. From tracking hurricanes in turbo-prop aircraft flown straight into the storm�s eye to a caver looking for microbes in some of the most inaccessible places on earth to �skywalkers� studying the ecology of redwoods from the crowns of the old growth forest, Jackson provides three vastly different and unique viewpoints on what the job of a twenty-first century scientist can be. There is danger to be found for sure, but also an enormous amount of intelligence and care in every step these people take as they pursue answers to nature�s questions. The title does not exaggerate; this is truly �extreme science,� but it is also exciting on both an Indiana Jones and Charles Darwin scale. In this title, Jackson makes clear that scientists must bravely engage in the world but also carefully bring information back to assess and investigate in the lab. Pamela Turner and photographer Andy Comins look much closer to home to tell the story of biologist Tyrone Hays in The Frog Scientist. Hays is involved in ongoing research into the effects of atrazine on frogs. Atrazine is the most commonly used pesticide in the United States, but Hays has discovered that exposure to atrazine causes �some of the male frogs to develop into bizarre half-male, half-female frogs.� His careful development, both in the lab and the wild, of experiments researching diminishing frog populations is an example of science at its best. Turner shows the control Hays and his assistants exert over their experiments so there can be no questions when their results are determined. For this real-world example of textbook standards alone, The Frog Scientist would be a winner in my book, but the fact that Hays is African-American, and that Turner makes his personal story key to the book�s narrative, raises it above similar titles in the field. His story is in fact just the latest example of the Scientists in the Field series showing diversity among the science ranks. In all three of these books, the work of both genders is celebrated, and the team tracking the snow leopard is peopled with a number drawn from the region, while Hays� laboratory is full of students from a variety of ethnic backgrounds. Teens will also appreciate that Hays and McCarthy have their children join them in their research and all are actively involved in their fathers� work. So regardless of gender, ethnicity or economic status, the Scientist in the Field titles will resonate with all readers. It's nonfiction writing (and photography) at its best, and incredibly inspirational to boot. As Sandler recounts, it was not really Tweed but the financial panic of 1873 that brought an end to the subway project and Beach sadly did not live to see the construction of the city�s subway system. The author recounts how it did eventually come about, however, and the part played in its development by the catastrophic Blizzard of 1888. (More than 400 people died and thousands were trapped as the streets and rail lines were covered in snow.) In the construction of the system, Beach�s original line was discovered one last time, and Sandler includes photos of his original tunnel as it was seen in 1912. �Beach�s subway car was still on the tracks� the magnificent waiting room fountain still stood tall.� Nothing was recovered, unfortunately, and the whole amazing experiment remains buried under city streets, waiting to be found again and hopefully, finally, celebrated. 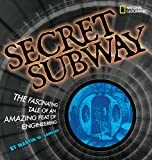 With dozens of photographs to accompany the text, Secret Subway is candy for history buffs and fans of underground cities. Whether you long to know more about New York, or invent an underground world of your own on the page, Martin Sandler is the guide you want, and the author who has finally brought a bit of limelight back to the irrepressible Alfred Beach. Finally, after reading Anastasia Suen�s Wired, I was reminded yet again of how valuable nonfiction picture books truly are. This patiently written step-by-step overview of electricity�s journey from dam to living room light switch is truly a brilliant book. Suen completely demystifies the process making it clear to even the least technologically inclined. There is a lot of new vocabulary here, but no word is casually used. Readers will easily understand atoms, electrons, generators, power plants and transformers. Suen makes sure you �get it� before she moves on. Paul Carrick�s three dimensional illustrations help as well by providing inside views of critical points, literally following the text (and the electrical journey) each step of the way. It�s so easy to understand what�s going on here that I found myself getting excited about a book on electricity. (Something I honestly never would have believed was possible.) No bells and whistles or cute characters can be found in Wired, just straightforward solid science. It will work for readers of any age (and I mean that -- confused adults can learn a lot here), but for that specific child already intent on taking apart small appliances, it will be a treasure. As for homeschoolers, it�s a no-brainer. If ever there was a book for a curious child, this is the one.